It was a good thing that I've saved the lesson plans for first days of school of the last couple of years. These help me to compare and plan and remember about first weeks and what I'm supposed to be focusing on, which is (in my case), mainly practical life and grace and courtesy. Since we have so many newcomers this year (11 new children and most of them just 3 years old), at this point it's all about laying the foundation for future work. Now our second week is coming up, so after observing the results of these lessons I refine these basic grace and courtesies and add what we saw problems with. So this week, for example, I'll be showing how to get up and sit down gracefully from the floor, how to tuck in your chair soundlessly, and try to fix the glitches like "how to turn the bathroom sign back to "GO" after you use the bathroom." And from here on it's all refinement and continuing to strengthen the foundation all while trying to keep things fun... adding movement games here and there certainly helps me keep the youngest ones with me. It's funny, as I am getting ready to start my 25th year in the classroom, I'm thinking about how I always forget how much the kids learn over the course of the year and how much they need to learn at the start, especially in the grace and courtesy area. Teaching in a public kindergarten (and grade 1 this year) I get a completely new batch of kids each year. This year, with grade 1 it will be different, but I wonder how much they will remember at the start. What a great list of grace and courtesy lessons! I'm on a break from teaching, and can already tell that I'll be living vicariously through your posts this school year ;) I hope week two is lovely! The photo is just so cute!! Thanks for the downloads and thank you for continuing to write such an awesome blog. 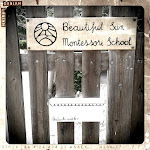 i am just completing my first week in my very first montessori classroom. we too are focusing on the same things in our room and as a new teacher (assistant) i am learning along with the children and really enjoying watching them interact with one another and their environment. i remember visiting your blog when you first opened your school. it is wonderful to see you continue to grow. thanks for sharing your journey. I can super relate to this post, I have a total of 7 new children who started this month and 8 more who started over the summer program. It's back to basics with grace and courtesy and we try our best to correct every little detail (even how to point, palm up... no pointer finger). The class is pretty quiet already with their inside voices and walking feet, but of course accidents and spills happen. It's "organized chaos" every September.